If you know me, you know I kind of have a "thing" for cookie pops. You will find some of the evidence HERE, HERE and HERE. 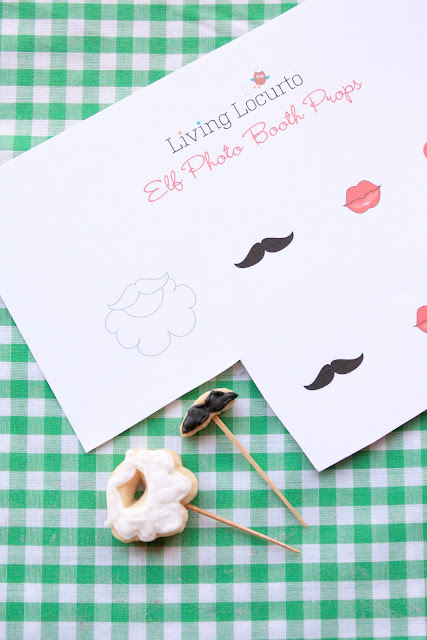 So, when I spotted some tiny photo booth props for "Elf on the Shelf" on Amy's Fabulous blog, Living Locurto, I was smitten! I knew I just had to make them into tiny cookie pops! As you can see, I could not get him to look at the camera~haha! First I needed to buy an elf, which my husband and I did last night. Even though we're empty-nesters, I plan on having some fun with this elf, unnamed so far:) Maybe our grandchildren can help us name him (they all have their own elves). I was kind of in a hurry for this photo shoot, so I kinda, sorta, had to use some tape to hold up the cookie pops. Whew, I feel better now that I got that off my chest (plus I think you can see part of the tape:)) I plan on coming up with a more authentic way (at least one that doesn't show) for him to hold the cookie pops, for when my grandchildren are here. I suppose I could lightly glue or velcro. Any ideas? Let cool. Using a small tip (I used 1.5) apply the royal icing. I outlined with the royal icing, and immediately filled in with a back and forth motion. I kept the icing on the thick side since I was applying it to such a small cookie. Let dry. This is day #5 of my 12 day countdown! Sue, seriously, you amaze me! My husband and I don't have kids yet, but I love the idea of Elf on the Shelf and this...this is so awesome! Jennifer, We don't have kids at home anymore, but I figure I can have a little bit of fun with this elf anyway:) I bet you could too! OMG how cute is this! I saw those printables...but I like the cookies better! You did not do this!! I'm laughing out loud right now at your adorable cookie pops, photos and the fact that you bought an elf on the shelf for your *empty nest* You made my evening with this post. Thank you for such cuteness! P.S. 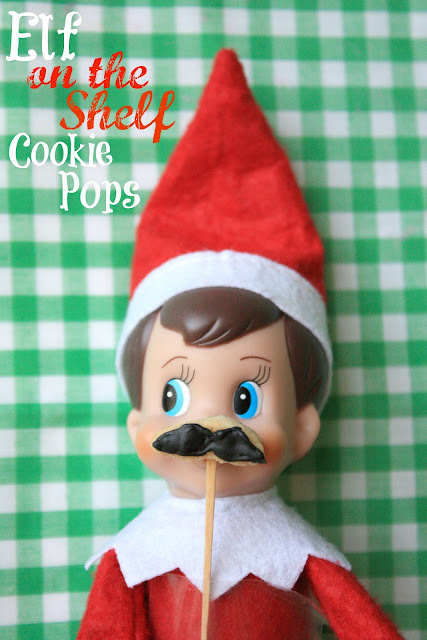 Wondering if a little dab of royal icing behind your cookie pops and pressed against the elf's nose would hold it long enough for a photo shoot with your grand kids? Oh my heck! Sue, these are so darn cute! 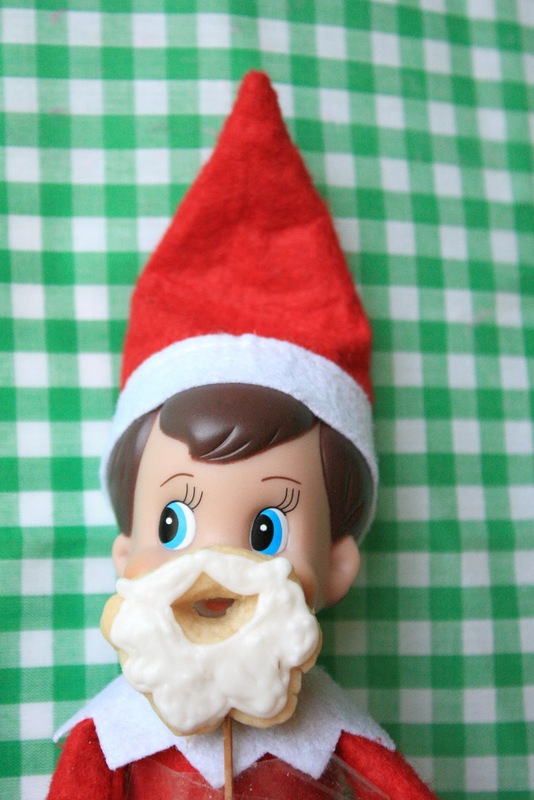 Our Elf is Zachary and he would LOVE to have some cookie props. My kids would think that was pretty cool too! Very cool! Oh my gosh this is hilarious!! Love the mini cookie pops! I love the cookie photo shoot! I found you through the Lil' Luna Link-up! You are hilarious Sue. Absolutely genius and so cute. Sue. You are the best. THE BEST!! Sue! This is the cutest thing I've ever seeeeeeeen!!!!!! ok i have to admit the elf on the shelf tends to be a little creepy sometimes, but this is totally cute!! love the mini pop!!! I'm always amazed by your incredible talent. This is brilliant. Those are just adorable! I love that you bought an elf even though you don't have kids at home! So cute! Thanks for linking up to the party! These are beyond adorable!!! I am just starting my Christmas baking...but I am having a hard time narrowing it down to what I want to make!off to peek around your lovely blog for more ideas. I can't stop smiling at these little cuties - great idea! I love these Sue, they're so cute and great for the kids to play with, then eat after. LOL. Is there any limit to your creativity? I just need the Elf of the shelf now, since that's pretty important. Sue - I found you at the linky and had to come over and visit and am your newest follower. Love the elf capades. This is my first year doing the elf and I'm having such fun with my students. Sue, you are so creative! How funny is that! Those are so teeny tiny! I can't believe it. Gah these are too stinking cute and very creative!!! AAAH! LOVE these! My kids would go nuts! Sue -- These are SO stinking cute! I can't even imagine trying to cut those tiny things out... much less decorating them! They are adorable! I'm just now seeing these! What a fun way to use my printables. Cute! Must've missed these while I had the flu last year. Seriously, CUTEST idea EVER! So doing this!!!! THANK YOU!!! Hi Sue! Totally cute, i really wanted to try these but unfortunately the props are only available for Exclusive Member printables :(...awesome work, i love them all! Awesome idea and work. Unfortunately, the props aren't available unless you have an exclusive membership.